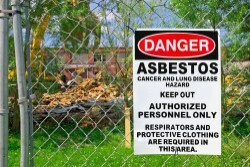 Asbestos is a serious danger on construction sites. A former elite sportsman now living in Australia is planning to sue a New Zealand-based company for exposing him to harmful asbestos inside building and concreting materials. According to the Northern Star, former yachtsman Lance Robinson is planning to sue Studorp Ltd in an Australian court, after being given authorisation by The Queensland Supreme Court. Mr Robinson claims that Studorp Ltd – then known as James Hardie & Coy – exposed him to asbestos during his childhood, when he would join his father at work on the company’s construction sites. Court documentation available from the New South Wales Caselaw shows that Mr Robinson was born in New Zealand in 1958. His father was a carpenter who handled asbestos products allegedly manufactured by Studorp Ltd. In 1988, Mr Robinson moved to Australia. Since then he has developed asbestos-related pleural disease. He claims that the disease is a result of Studorp Ltd’s unsafe asbestos safety practices. According to the Australian National Health and Medical Research Council (NHMRC), asbestos related pleural disease involves an “inflammation and irritation of the outer lining of the lung”, also known as the pleura. Affected individuals suffer from a stiffening and thickening of the pleura, which can lead to restriction in breathing. Studorp Ltd had previously argued that Mr Robinson’s case should be heard in a New Zealand court of law. However, the Queensland Supreme Court disagreed, and the case will now be heard in Australia. While Mr Robinson’s claims are only allegations at this stage, the story does highlight the importance of proper asbestos training for those working around this harmful mineral. Each state and territory has its own regulations related to asbestos work health and safety, and it is important to be well aware of these before beginning any construction project.